The five most popular stories on CNN.com during the past 24 hours, according to NewsPulse. California fire scene 'like a moonscape': The gas line fire in San Bruno, California, that killed four people and destroyed 38 homes has been fully contained with some small hot spots, authorities say. MTV VMAs' shocking style moments: From the very beginning of the MTV Video Music Awards, stars like Madonna have aimed to please fans by shocking them with a combination of risqué routines and outré fashion. Trading was choppy and light Friday, with stocks barely ending the week higher as investors wavered between mildly upbeat data and ongoing fears about a slowing economy. For the overall week, the Dow Jones industrial average rose 15 points, closing at at 10,463 on Friday. The S&P 500 added 5 points to end at 1,109, and the tech-heavy Nasdaq Composite rose 10 points to 2,243, according to early tallies. conducted Friday. The results were not immediately known, said Special Agent Mike McDaniel of the Georgia Bureau of Investigation. With 25 people killed in violent outbreaks, Thursday was one of Chihuahua state's deadliest days of the year, the state Investigations Agency said on Friday. Seven of the victims in Mexico were women and girls and two were 15-years-old, said agency spokesman Arturo Sandoval. One of the males killed was 17, he said. of American hiker Sarah Shourd has been "canceled," because legal procedures have not been completed. was supposed to be released Saturday. 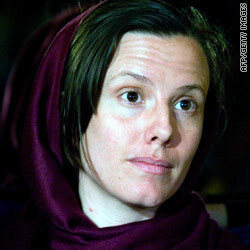 She, along with Shane Bauer and Josh Fattal, were detained July 31, 2009, after they allegedly strayed across an unmarked border into Iran while hiking in Iraq's Kurdistan region. Kim Clijsters and Venus Williams will square off in a big match that will send one of them to the finals. So much for that supposed Super Bowl hangover. New Orleans kicked off its 2010 season exactly how it finished its 2009 campaign, with a win. The Drew Brees-led Saints edged Brett Favre and the Vikings last night 14-9 in the NFL’s season-opener. There was no offensive explosion, no onside kick to begin the second half and no fourth-quarter comeback by the grizzled Favre, but there was plenty to note. SI.com’s Don Banks breaks down the many compelling storylines from Thursday’s opener, including the Saints’ reinforced defense and the Vikings’ potential problems. Venus Williams (3) vs. Kim Clijsters (2) (12:30 p.m. – 6:00 p.m., CBS) The women’s semifinals take centercourt in Flushing Meadows today when two of the game’s biggest stars square off for a berth to the finals. [Updated at 12:25 p.m.] President Obama was asked about his thoughts on the Islamic center being built near ground zero in New York. "All men and women are created equal, they have certain inalienable rights, and one of those is to practice their religion freely," Obama said. "You can build a church on a site, you can build a synagogue on a site, if you could build a Hindu temple on a site, you should be able to build a mosque." Obama said he recognized the sensitivity in the area because of the 9/11 attacks and acknowledges that family members are continuing to experience pain and anguish over their losses. However, he urged people to remember who our real enemies are. "We are not at war against Islam. We are at war against terrorist organizations that have distorted Islam or falsely used the banner of Islam," Obama said. "If we're going to deal with the problems Ed Henry was talking about - reducing the terrorist threat - we need all the allies we can get." Obama pressed that in fact, the anti-Islam sentiment and a war between the West and Islam is exactly what terrorist organizations are hoping for. "Al Qaeda, that's what they've been banking on," Obama said. "The overwhelming majority of Muslims are peace-loving - are interested in the same things that you and I are interested in." Obama stressed it is important that Americans do not believe the entire religion of Islam is offensive. For more on Obama's question-and-answer session and analysis check out CNN's Political Ticker. CNN Security Analyst David Gergen said he believed Obama's press conference was "mostly passionless and, frankly, boring" until the mosque question. There, he took a much clearer stand on the mosque than he has in the past. CNN political analyst Roland Martin, however, criticized the summation, saying he is not looking for anyone in Washington to "enamor me." However, Martin said, he would have liked to have seen Obama be clearer about Republicans setting up roadblocks, saying no and blocking progress. "You know what? He's not an entertainer," Martin said of Obama. "He's the quarterback. He has to set the tone," Martin said. CNN's John King, host of "John King U.S.A." said he was impressed by his "long, substantive answers" on several of the issues and noted that on some questions he spoke for three, six and seven minutes to address some of these issues. Candy Crowley, host of CNN's "State of the Union," said she got the sense that Obama did not want the issue of the mosque to be raised, but everyone on the CNN panel seemed to agree that Obama was most passionate in addressing that specific issue. Blustery winds that have fanned a raging Colorado wildfire this week are expected to gust into Friday evening, possibly pushing the flames into the city of Boulder, the National Weather Service said. Forecasters have issued a red flag warning for Fourmile Canyon and other foothill locations in Boulder, Jefferson and Larimer counties. On Thursday, Boulder authorities warned some city residents to prepare to evacuate as winds gusting as high as 50 mph threatened to drive the wildfire out of the hills and into city limits. The fire, which is 30 percent contained, already has charred nearly 6,400 acres of countryside and destroyed 169 homes west of Boulder. No additional homes were damaged or destroyed overnight, according to a fire official. Filed under: Colorado • Fire • U.S. The Iranian government has announced that on Saturday it will release Shourd, one of three American hikers who have been detained in the country for more than a year. Shourd, along with Shane Bauer and Josh Fattal, were detained in July 2009 after the Iranian government said they strayed across an unmarked border into Iran while hiking in Iraq's Kurdistan region. The three were accused of being spies; they deny the charges. During a visit to Iran earlier this year, Shourd's mother, Nora Shourd, said her daughter was very ill and suffering from depression. Shourd and Bauer became engaged while imprisoned and plan to get married after their release. The native of the Ivory Coast and mother of three lost her husband in the September 11 attacks on the World Trade Center in New York. Traoré’s husband, Abdoul-Karim Traoré, worked at Windows on the World, a restaurant on the top floors of the North Tower. After the attack, all that was found of him were his wallet, his identification cards and a few coins. Traoré, a Muslim, takes her children to ground zero every September 11 to pray. She says praying there feels entirely natural, even if some of those standing nearby blame her religion for the attacks. At least six people were killed and more than 20 were injured Thursday after a gas main exploded and destroyed more than 50 houses in a San Francisco, California, suburb. Brothers Bob and Ed Pellegrini said in the San Jose Mercury News that the ground shook violently and they thought there was an earthquake in the Bay Area. Then they saw the flames. “It looked like hell on earth. I have never seen a ball of fire that huge," Bob Pellegrini said. Marilyn Siacotos, 76, escaped through her back door when she saw flames on her street. "I didn't look back," she said. "I just got out before anybody (emergency responders) came." Retired San Bruno Fire Battalion Chief Bob Hensel, who also had to evacuate, said it was the biggest fire he had seen in decades. He said his wife's car bumpers melted from the heat. "I heard a big whooshing sound and there was a boom. Stuff started hitting the house and then it got yellow outside and then real warm," Hensel said. The California Public Utilities Commission is investigating the cause of the explosion and fire. Concessions were banned on bases at one point because they took up space for supplies. U.S. troops in Afghanistan may soon get their burgers back. Army Command Sgt. 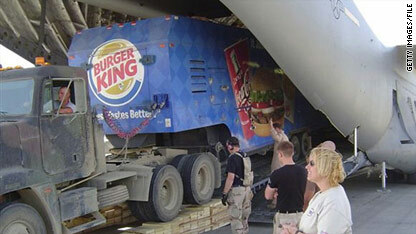 Maj. Marvin Hill, who took over as the senior non-commissioned officer in Afghanistan this month, told Stars and Stripes on Thursday that he was reversing a ban on fast food concessions such as Burger King and Kentucky Fried Chicken that had been instituted earlier this year. “For troops to be able to go and grab a burger or a piece of chicken or whatever, I don’t really think it’s that bad,” Hill told Stars and Stripes. The concessions ban had been put in place by Gen. Stanley McChrystal in February as the military was boosting its troop strength in Afghanistan. McChrystal said the concessions took up space on bases and in supply lines. “This is a war zone - not an amusement park,” McChrystal’s senior NCO, Sgt. Maj. Michael Hall, said at the time. But when Gen. David Petraeus took over command in Afghanistan during the summer, he allowed a review of the fast-food policy. Firefighters battled a deadly gas-fueled blaze Friday that engulfed dozens of homes and sent fireballs shooting into the air in a neighborhood near the San Francisco airport. "It looks like a bomb went off, " said Abel Maldonado, California's lieutenant governor. "I saw debris everywhere. It was a huge explosion. I am shocked. This is a horrible tragedy that hit San Bruno." At least three people died in the fire, according to Dena Gunning of the San Bruno Fire Department. Pacific Gas and Electric spokesman Blair Jones said Friday that its gas transmission line ruptured, leading to the blaze. The cause of the rupture was still under investigation. Filed under: California • Fire • U.S. The pastor at a Florida church that planned to burn copies of the Quran added to confusion Friday over whether he intends to go ahead with the controversial event. The Rev. Terry Jones told CBS' "The Early Show" that "we have called the event off." Soon afterward, however, he told reporters in Florida the burning is still being contemplated. "We are seriously, seriously, seriously considering not burning the Qurans. That is absolutely right," Jones said. Challenged by a reporter, Jones then said, "Well, we are hoping that we can come to a conclusion." "Are you or aren't you?" a reporter asked, to which Jones replied, "We're actually not prepared to answer that right now." Filed under: Anti-Islam • Christian • Florida • Islam • Religion • U.S.
San Bruno fire - Firefighters were still battling a deadly gas-fueled blaze Friday that engulfed dozens of homes and sent fireballs shooting into the air in a California neighborhood near San Francisco International Airport, emergency management officials said. At least three people are dead, dozens are injured and more than 170 homes are damaged after a natural-gas line blast set the neighborhood on fire. An iReport contributor captured video as he drove in the area minutes after the explosion. Video footage showed gas exploding into flames and causing a "loud roar." If you're there and you see anything, send iReport photos or videos to help CNN tell the story. 9:00 am ET - World Suicide Prevention Day event - Defense Secretary Robert Gates and HHS Secretary Kathleen Sebelius launch the National Action Alliance for Suicide Prevention. 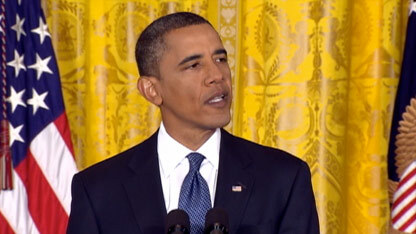 11:00 am ET - President Obama news conference - President Obama holds a news conference for reporters in Washington. 11:00 am ET - Colorado wildfire briefing - Fire officials brief reporters on efforts to contain a wildfire that has scorched thousands of acres in Colorado. 11:00 am ET - San Bruno fire briefing - Fire officials are expected to participate in a briefing on a gas explosion and fire that devastated a neighborhood in San Bruno, California. 1:00 pm ET - Arkansas Senate debate - Sen. Blanche Lincoln and Republican opponent Rep. John Boozman face off in a debate in Little Rock, Arkansas. One person is confirmed dead and seven people are injured in the massive blaze that has engulfed dozens of homes in a San Bruno, California, neighborhood, Kelly Huston of California Emergency Management said.